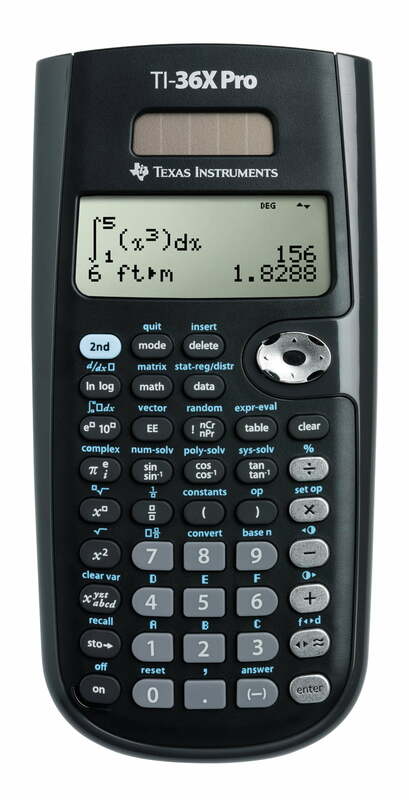 Advanced, four-line scientific calculator with higher-level math and science functionality. MathPrint™ shows math expressions, symbols and stacked fractions as they appear in textbooks. Input data, scroll through entries and make edits like using a graphing calculator. Store real numbers and expressions that result in real numbers as one of seven available memory variables. Enter data in up to three lists – any list formulas entered can accept calculator functions. Choose from three solvers: numeric equation, polynomial and system of linear equations. Display a defined function in a tabular form. Determine the numeric derivative and integral for real functions. Perform vectors and matrices using a vector and matrix entry window. Choose from nine physical constants that can be pasted into various windows and an easy-to-use menu that includes 18 Metric/English conversions. Dual power source: Solar and battery.